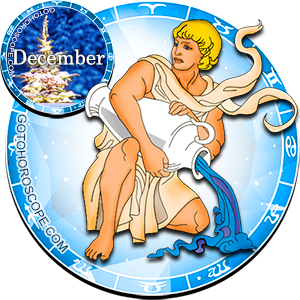 December 2015 Horoscope Aquarius, free Monthly Horoscope for December 2015 and Aquarius Astrology Forecast for the month ahead. With respect to the zodiac sign of Aquarius, what can be said about December 2015 for the people born under this sign is that it's a successful and promising time, but not the easiest one to come. The fact is that Saturn, the planet-ruler of Aquarius, is as strong as ever. The Lord of the Rivers of Time will be able to deflect the lion's share of interstellar negativity that in other circumstances could have played a decisive role in the life of an Aquarius. It will take all up all of his energy. Meanwhile, the emanations of Mars (traditionally responsible for the fall of the sign) will change the polarity of their vibrations, allowing dynamic and powerful support to overcome all obstacles and resolve any problematic situations. However, the feature of the current situation will be that Mercury, the planet-exalt of the Aquarius sign and responsible for the flowering of its vitality, will dramatically and irrevocably replace the modality of his energy and turn into a ferocious enemy. This will be a difficult situation, ambiguous and very negative, because members of this sign will have a shortage of vital energy and they will not be able to realize their full potential for this month. 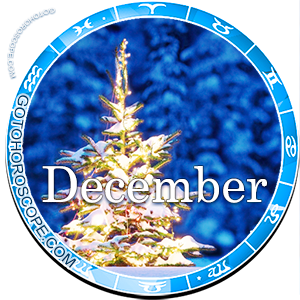 In terms of the direction of work, such a situation will not allow the zodiac sign of Capricorn to achieve all of his goals in December 2015. This means that at the dawn of the first ten-day period of the month, it will be worth to adjust your plans based on such unusual circumstances. In fact, not all of those projects that you would like to implement at this stage will be of paramount importance. Or maybe all will be even more interesting - almost all of your ideas will not make sense when reconsidered. For you it may be a severe blow, but it is better than wasting time and money without any response. Therefore, if you do not have your own business, try to analyze the current situation as clearly as possible. Do not get yourself to perform an entire month worth of meaningless work and eventually even receive word from the leadership that you achieved nothing. Believe me, few people will care about the fact that in this case, it was impossible to achieve anything and it was not your fault. So be careful, ergonomic and communicative. Then you will be able to realize only those plans that actually will be helpful for you and your environment. It is rational, just and right. The love front of December 2015 will not bring the zodiac sign of Aquarius any amazing and stunning moments that could be stored for a long time in your memory. However, this is not to say that you will not achieve your goals or fail to do what you should. You should never forget about the individual aspect, which under certain circumstances can be extremely powerful. Just remember that you will not have so much energy, so seizing everything will not be the best idea. If you want to organize some kind of a mass event with the participation of your friends, or if you are planning a wedding in December - that may be a bit too much. Because life energy is the foundation of your existence, your creativity, without which human life is meaningless and simply dissolves in the vanity of vibrations. Think about that and decide what is more important right now, in the twilight of the annual cycle. Mybirth date 8,2,1978 please tell when my marriege can hapening? So unfair...im planning to marry december. It is only general December 2015 horoscope so it cannot predict evrething for everyone. To be sure you shoud get personal horoscope for the date of your marriage. I felt this reading was so negative. Any person not feeling positve should take no notice of what has been wriitten, otherwise they could start getting depressed.